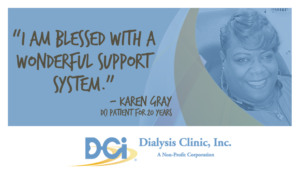 Last March, DCI Cumberland patient Karen Gray celebrated her twentieth anniversary on dialysis. Karen’s story began back in 1995. In one doctor’s appointment, she found out her life was changing, and in more ways than one. “I was told that I was pregnant, and in the very same breath, my doctor told me my kidneys weren’t working properly,” Karen said. She and her husband, Bruce, had been married for three years when they got the news. Her medical team recommended she terminate her pregnancy due to the new diagnosis, but Karen resisted. She did not want to lose her future child. After carrying her baby for 27 weeks, she gave birth to her son, who she calls her miracle. “He came into this world weighing just two pounds. He stayed in the hospital while I was preparing for my fistula. I began my first dialysis treatment about three months after he was born, in March 1996,” she said. Karen has been an in-center hemodialysis patient with DCI Cumberland ever since. Over the last twenty years, Karen and Bruce’s family has grown quite a bit. She now has three children and two grandchildren, all of whom she adores. In spite of her kidney failure, becoming a parent and grandparent, and working full time, Karen remains committed to her dialysis treatment. In two decades, she only missed three treatments: two due to snow, and one due to an access repair surgery. Karen continues to travel to new places, often saying she doesn’t let any grass grow under her feet. She attributes her positive outlook and optimism to her family. “I am blessed with a wonderful support system,” she said. Over the years, Karen said she has seen and experienced improvements to dialysis treatment, and now, she is working on becoming a kidney transplant candidate. “I’m fired up to become a transplant candidate and future recipient,” she said with confidence. Robin Oliver, LAPSW, social worker at DCI Cumberland, said Karen is someone which any new dialysis patient can learn from. Thank you Karen, for your leadership at DCI Cumberland, and we congratulate you on this milestone!